(Phys.org) —A team of researchers with the U.S. Geological Survey has found that a large amount of ancient helium is constantly being released in Yellowstone National Park—the result, they suggest in their paper published in the journal Nature, of a magma hot spot releasing previously trapped gasses. In surveying the gasses that emanate from various parts of the famous park, the researchers discovered far higher amounts of the helium-4 isotope than was expected—approximately 60 tons every year. Helium isotope emanations generally come in two varieties, helium-3 and helium-4. Helium 3 has been found by prior research to come from deep within the Earth, whereas Helium-4 is more often found in the crust—the result of decaying radioactive (uranium and thorium) elements. Helium-3 has been measured at the park before—it gets pushed up to the surface due to ancient volcanic activity. Finding Helium-4 emanating from cracks and fissures in above-normal amounts indicated that the helium was coming from the crust. But why so much? To answer that question, the researchers looked at the long geological history of the region—approximately two million years ago, volcanic activity began in the area. Prior to that, they say, the area was relatively quiet, for perhaps as long as a couple of billion years. During that time it appears that helium was building up in the crust (because there was no groundwater or crust movement), but not so much to the point that it created enough pressure to push its way to the surface. That didn't happen until the area became volcanic—hot magma beneath the trapped helium pushed it upwards, eventually squeezing it through cracks, steam vents and geysers at the surface. And that's why it's happening right now—it's been going on all this time and has just now been noticed. Because the helium is so old, the researchers believe it might hold secrets about the maturation of our planet—it also provides another example of gasses or liquids being held in the Earths' crust for billions of years, which some suggest might mean that its possible some forms of subsurface life exist that have never been seen. Helium is used as a critical tracer throughout the Earth sciences, where its relatively simple isotopic systematics is used to trace degassing from the mantle, to date groundwater and to time the rise of continents1. 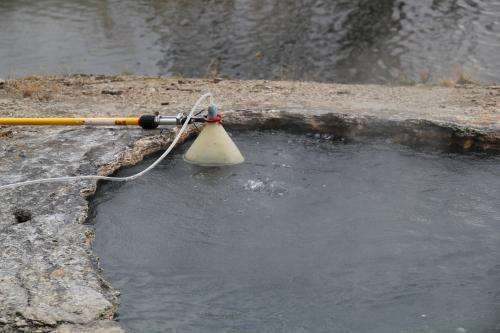 The hydrothermal system at Yellowstone National Park is famous for its high helium-3/helium-4 isotope ratio, commonly cited as evidence for a deep mantle source for the Yellowstone hotspot2. However, much of the helium emitted from this region is actually radiogenic helium-4 produced within the crust by α-decay of uranium and thorium. Here we show, by combining gas emission rates with chemistry and isotopic analyses, that crustal helium-4 emission rates from Yellowstone exceed (by orders of magnitude) any conceivable rate of generation within the crust. 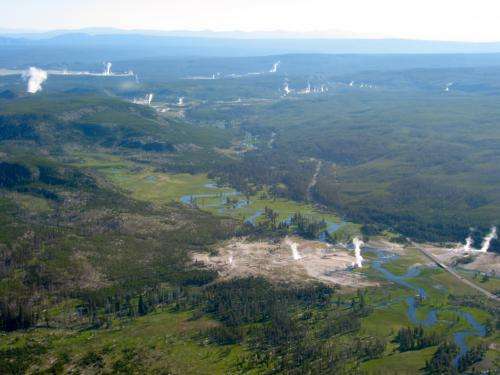 It seems that helium has accumulated for (at least) many hundreds of millions of years in Archaean (more than 2.5 billion years old) cratonic rocks beneath Yellowstone, only to be liberated over the past two million years by intense crustal metamorphism induced by the Yellowstone hotspot. Our results demonstrate the extremes in variability of crustal helium efflux on geologic timescales and imply crustal-scale open-system behaviour of helium in tectonically and magmatically active regions. Note that Sellafield in UK has noted an upsurge in released radon from the crust also. I believe our core is being heated by the sun's unusual magnetosphere and equatorial release of energy. Our science has launched Mars satellites especially to pick up on this release; by gauging how much is or is not being released by Mars after the sun finishes reversal a comparison can be made as to how much energy will be released by the heated Earth's core. katesisco, got any source on that? I believe our core is being heated by the sun's unusual magnetosphere and equatorial release of energy. ... after the sun finishes reversal a comparison can be made as to how much energy will be released by the heated Earth's core. I too am curious. How do you propose that the Sun is heating Earth's core without those of us on the surface somehow not noticing? 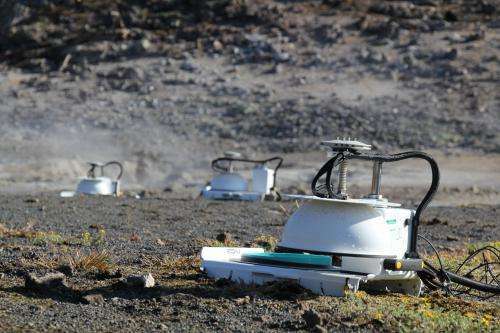 "...both tritium and 3He/4He ratios are low for subducting zone volcanoes, yet anomalously high for the hot spot volcano Kilauea and, evidently, Alcedo "geyser"." is the hyphothesis not redundant? "This hypothesis can be tested by measuring tritium and helium-3 in magmatic fluids from hot-spot volcanoes which tap magmas from plumes arising from the core-mantle boundary. In particular, magmatic waters of Kilauea, Loihi, and Icelandic volcanoes are predicted to contain significant tritium." don't they predict something already proven? Oh, another Zephyr sockpuppet! There is no process by which cold fusion arises in the crust Zephyr. which ... Stephen Jones in 1986 already. The solar activity is followed with increased neutron flux, which induces the heat waves inside of Earth crust. We have many indicia for this neutron flux already. Heat waves in the crust? Really. That's a new one for you Zeph. You can cite proof of this of course (probably not!) I also look forward to you showing the "many indicia" for this "neutron flux" thing you're alluding to. just FYI- Bonia and Rimino are the latest incarnations of Zephir because he pushes pseudoscince like Aether and Dense Aether philosophies and that has gotten him banned from here a few times. Doesn't Sellafield have a nuclear reactor that is famous for tritium leaks? It isn't proven that these sites are releasing these isotopes. Science deals in theories, not proofs. So nothing is proven... The theory suggests that they will find high levels of these isotopes at these sites. The only way to know if it is correct, is to gather data. ..the latest incarnations of Zephir..
Good to know, was already wondering what's up with those Zephyr posts. ..The theory suggests that they will find high levels of these isotopes at these sites. The only way to know if it is correct, is to gather data. The way to gain knowledge in science is known to me, but since English is not my first language, my choice of words is certainly debatable. Despite the most presumably not given reliability of the source provided by Bonia, what made me ask my question was the fact that the source states that measurements were carried out which reveal high concentrations of tritium in hot-spot volcano magma and in the next paragraph the author/s suggest a hypothesis which they say "can be tested by measuring tritium [...] in magmatic fluids from hot-spot volcanoes". Seems redundant to me, since there's data obtained from measurements, then they build up a theory which could be proven by measurements that have already been made.